Last two weeks was pretty busy, and we attended multiple events, so I decided to share what happens with all of you. On behalf of Sentrium, I (Yuriy Andamasov, that is) with other Sentrium employees visited VMworld, OpenStack Summit, and a meeting held by an ISP consortium known as Guifi in Barcelona this October. Among other things, one of my goals was to find out if there’s any interest in VyOS in the enterprise and cloud markets. I’m excited to see that VyOS seems to be the best deal for many use cases. There are so many cool applications and technologies around, many of them require networking, other provide networking functions and/or orchestration functions for large deployments. However, many people are interested in integration with management tools and other software, so we came to the conclusion that it’s a good idea to provide integration with VMware NSX and OpenStack Neutron at least, as they are quite popular. Of course, we need your help with it. If you are interested, or even already working on it, feel free to contact us, come to Phabricator or the IRC channel, or contact me personally by email (yuriy@sentrium.io) or in the RocketChat (I’m syncer there). I’ve also had a great conversation with Netronome people regarding their SmartNICs and VyOS and how we can collaborate on open source solutions which get best from software and hardware worlds and hopefully this collaboration can bring us some truly impressive results. As we realized and as strange it is to us, many people just never heard about VyOS and only some of them heard something about Vyatta Core, so we are trying to raise awareness of it, and that was one of the reasons I attended those events. We made some leaflets with information about the project, and I handed them out at all those events I attended. 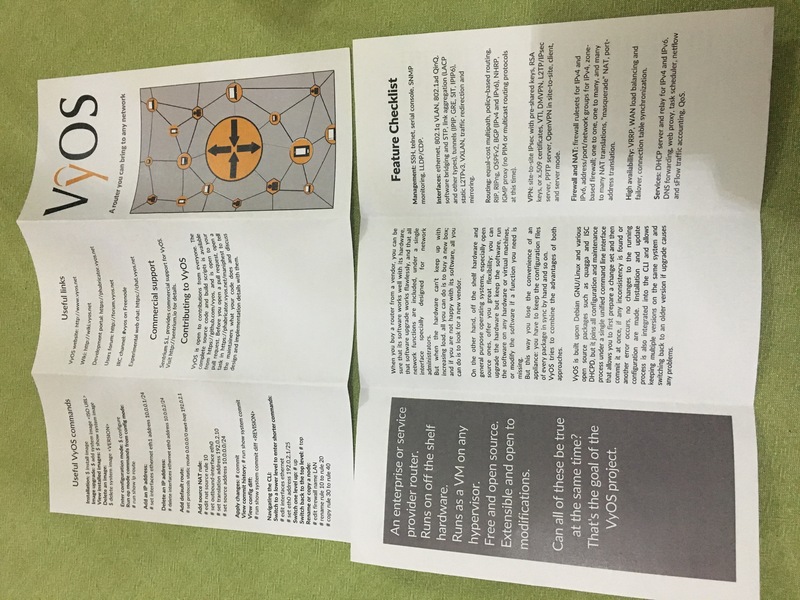 We’ll make a PDF and Scribus source files available soon so that you can print them for your own use if you are going to attend an event and promote VyOS there. We also gave a talk about VyOS at the Guifi meeting. Guifi members are building a big community network here in Spain, and we think that VyOS is a perfect match to this effort. Later this year we are going to give a more detailed technical talk, discuss the challenges they are having and see how VyOS can help them make their network better. 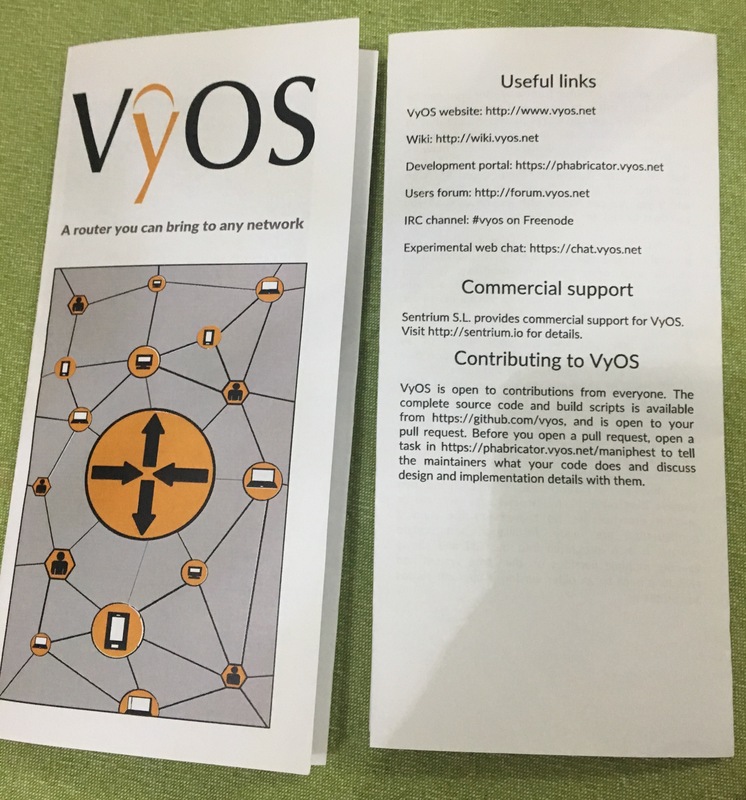 We hope this effort will help VyOS to acquire a wider community interested in open source networking. Remember that even if you are not a programmer, there are still lots of things you can help with, such as testing, feature design discussion, documentation, howtos, and just helping other community members on our forum or chat. Now when this streak of community building events is over, we all can get back to working on the code. Daniil(dmbaturin) is working on the 1.1.8 maintenance release and messing around with the nextgen VyOS prototype, and 1.2.0 beta still needs your testing, so please, pick up it here and give it a try, but remember that it still not production ready.